Zulu warrior with weapons in 1902. 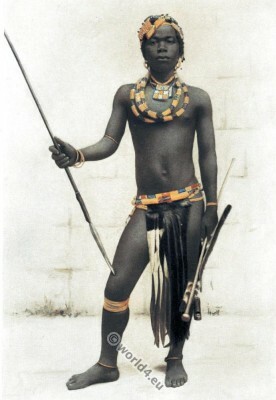 Home » Zulu warrior with weapons in 1902. Zulu warrior from Mariannhill KwaZulu Natal, South Africa. From the book: Living Races of Mankind. A popular illustrated account of the customs, habits, pursuits, feasts, and ceremonies of the races of mankind throughout the world, by Henry Neville Hutchinson (1856-1927), John Walter Gregory and Richard Lydekke. Published by Hutchinson & Co. Paternoster Row, London 1902. The dark continent; Africa, the landscape and the people by Hugo Adolf Bernatzik. Souvenir de L’Exposition Universelle de Vienne. Costumes of Japan and Java. The Peninsula war. Character, Costume in Portugal and Spain. Our islands and their people. Hawaii, Philippines, Puerto Rico, Cuba. Costumes of all countries by Alexandre Lacauchie 1850s. Historical and folk costumes by Franz Lipperheide. The costume of Turkey. Ottoman Empire 18th century. The Switzerland national costumes of 17th ‚18th, 19th century originals. Folk dresses from Norway, Dutch, Germany and Hungaria. Mexico by Carl Nebel 1836. Chinese sceneries in 19th century. by Thomas Allom. Provincial Russia. Costume and Culture. Costume of the Russian empire by Edward Harding. Serbian national costumes by Vladimir Kirin. Historical European costumes by Auguste Wahlen. The Highlanders of Scotland, 1870. The dark continent. Africa, the landscape and the people 1931. Historical costumes from Africa, America and Oceania. Traditional folk costumes of Italy and France in 1821. This entry was posted in 10s, 20th Century, Africa, Military, South Africa and tagged Living Races of Mankind, Traditional African dress, Traditional Zulu clothing, Weapons on 11/16/14 by world4.